Sift the flour, baking soda, baking powder, salt, and cinnamon powder together in a bowl. In a separate bowl, beat with a fork the egg with the sugar, honey and melted butter, until all the ingredients are incorporated. Put the content of the 2 bowls together; add the bananas and start mashing them with a potato masher, mixing all the other ingredients together at the same time. When you have a uniform dough, add the shaved almonds and flaxseeds. Mix well. Use silicon muffin cups to make this. If you can't, use regular muffin cups, but spread them with butter and cover them with flour first. Put 2 heaping tablespoons of dough in each cup. Bake for 20 minutes. Pierce with a fork, knife, or stick. If it comes out clean, the muffins are ready. If it has some dough stuck to it, bake for 5 extra minutes. Let cool in a cooling rack, unmold, and serve. 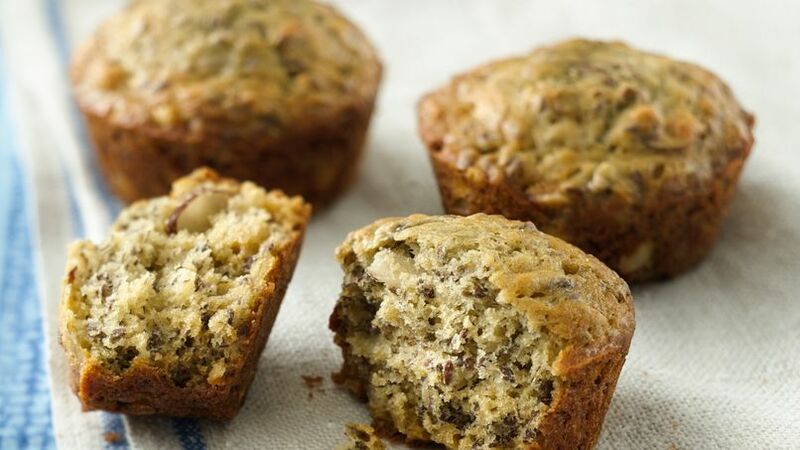 Store these muffins at room temperature, in an air-tight container for up to 3 days. You can also freeze these muffins in plastic bags for up to a month. Thaw at room temperature and eat immediately. If you want, you can heat them up in the oven before eating. Other than flaxseeds, you can use chia seeds, poppy seeds or sunflower seeds to make this. Morena Escardo Banana bread is one of those timeless recipes that are famous everywhere in the world, and will never go out of fashion. I've been eating banana bread since I was a kid, and still seem to find it wherever I go. Always simple, always delicately sweet and spongy… it's hard to get it wrong with this cake. For this reason, when I started a baking business some years ago, the first recipe I tried to perfect was this one. I knew I would have instant sales if I made banana bread, and I was right. Everyone loves it! For those of you who don't have a loaf pan to make a traditional banana bread, those who want to prepare it in smaller portions for entertaining, or those who simply want an easier way to carry their banana bread around, here's an easy way to turn this classic into cute little muffins.